CEDAR CITY — State Route 130 near milepost 34 was shut down for 16 minutes Friday afternoon as four tow trucks worked together to flip a concrete truck upright after it lost control in the soft berm alongside the road and flipped onto its side. 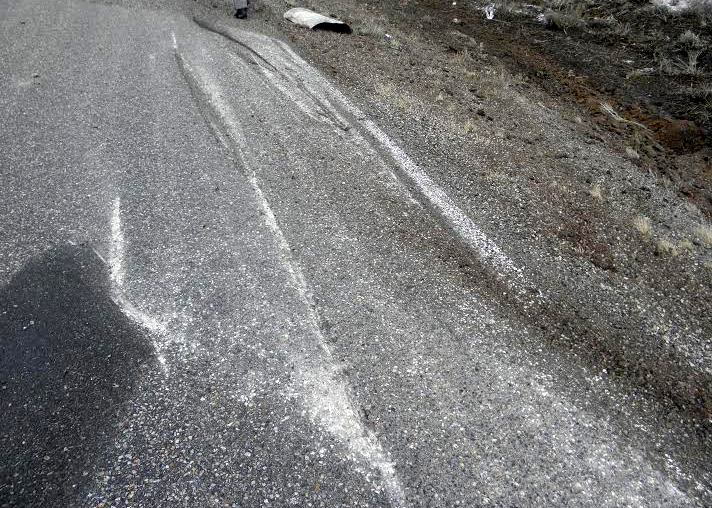 Utah Highway Patrol and Beaver County Sheriff’s Office deputies were dispatched to the northbound lane of state Route 130 at 1:58 p.m., Trooper Bambi Baie said. When they arrived they found the driver uninjured, she said, but the highway did have to be shut down from 3:13-3:29 p.m. while crews worked to pull it up on to it’s wheels. The Western Rock Products truck driver was hauling concrete to the Mortenson construction solar plant sites in Milford. “The shoulder’s a little mushy out there,” Baie said, explaining how the trucks wheels were sucked in by the berm along the side of the highway causing it to lose control and flip over onto its passenger’s side while going around a bend. The driver came up on the bend a little faster than he should have considering the weight of the full load he was hauling, she said, then added that he was not exceeding the speed limit, but rather the weight made it difficult for him to slow down and maneuver fluidly. The concrete truck that landed on its side slid off of the road and onto the embankment to the right. In order to get the truck back on its wheels however, Baie said the four wreckers needed to be on the opposite side of the road as they all pulled together. That was the only reason the road was shut down at all, she said.